If you thought the zombie genre were exhausted of originality, the latest marvelous low budget horror flick “Pontypool” arrives with the same confident attitude associated with all of Bruce McDonald’s films. It’s an intensely idiosyncratic genre film, perhaps more admirable than entertaining, but original and distinct. We’re in a rural town in Eastern Ontario, a cold winter night, in a small radio station run by a skeleton crew. The morning show radio man, Grant Mazzy, a wayward grizzled veteran goes about his usual boring work. His only respite is the fun pugnacious disobedience he goes through with his stuck-up radio producer, Sydney Briar (Lisa Houle). When his traffic reporter reports a riot of local citizens suddenly Mazzy finds himself at the heart of an international news story. The crisis is played entirely from within the radio station, and so like Mazzy, we’re never quite sure of its severity or whether it’s all just a hoax. Soon the riots turn violent with dead bodies piling up. When the young production assistant Laurel Ann succumbs to the mysterious outbreak, Mazzy and us, the audience, realize zombies have stricken the town. As the army of soulless deadbeats encroach on the station Mazzy and Sydney scramble to understand the cause of the outbreak. McDonald and his writer Tony Burgess give us an ingenious and particularly peculiar new twist to the zombie genre when it’s revealed that the virus is spread through words, an infection through the English language which causes the person to misinterpret the meaning of words and thus reduce themselves to uncivilized base animalistic behaviour. Stephen McHattie, one of Canada’s venerable character actors who appears prominently in Canadian-shot American blockbusters (he plays Hollis Mason in a little movie called “Watchmen”), seems to channel his 30 years of grouchy cop, gangster, and drug dealer roles to craft the ornery rebellious protag Grant Mazzy. He plays Mazzy like a Howard Stern in exile, a talented radioman, who’s burned so many bridges in his career he’s relegated to the pathetic traffic-report-reliant small town gig. But in the crisis Mazzy’s gift for gag allows him bring out his inner hero. As a radioman, the linguistic connection to the zombies, makes for a clever spin on the genre, the explanation of which is detailed through some intense and incomprehensible dialogue. It made no sense to me (neither does Noam Chomsky for that matter either), but the fact that the characters seem to have a grasp on it allows us to suspend our disbelief. It also allows Burgess and McDonald to execute some hilarious gags as well as witty send-up of French-English Canadian relations. The throughline is this irreverent sense of humour and McDonald’s supreme confidence with the genre. Though McDonald has never made a horror film before, he’s a veteran of this type of low budget, rebellious, independent filmmaking. And there’s no mistaking the presence of McDonald’s trademark hat, which Mazzy wears prominently throughout, as a reminder of whose film this is. Enjoy. 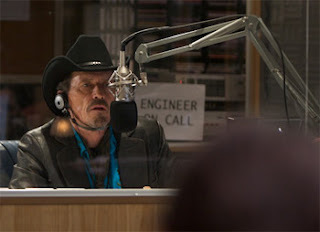 “Pontypool” opens today in Canada, and on May 29, by IFC in the U.S.